Status of your three most active folders when you have not logged in for more than one day. Notification that specific users have not downloaded a file from a secure link you shared after one day. Quick access to members of a meeting for file sharing. You can view the Insights screen from the main screen by tapping the dot to the right of your photo. This brings up the Insights screen. Any Meeting Insights are shown first, followed by any Usage Insights then Shared Link Insights. Only one meeting insight is docked. 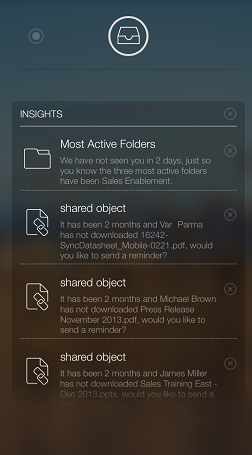 Usage Insights notifies you of the three most active (defined as the number of create, update, delete events) folders in your account. This insight is triggered when you have not used the app for more than one day. Shared Link Insights is triggered when a recipient has not downloaded the file that has been shared with them for more than one day. With just one tap, you can send a reminder email. Meeting Insights helps you to send a file or a document during or immediately before or after a meeting with the meeting attendees. When you take a photo or create a document while in a meeting, a notification is triggered that prompts you to share the file with the attendees of the currently running meeting(s). If you choose to share the file, the shared links interface is pre-populated with the email addresses of the meeting attendees.